On Tuesday, the national nonprofit Propane Education & Research Council surprised teachers at Sierra Enterprise Elementary School in California with a $5,000 donation in recognition of Elk Grove Unified School District’s (EGUSD) efforts to maintain good stewardship of its economic and environmental resources by adding propane buses to its school transportation fleet. The donation is part of PERC’s nationwide campaign to educate parents, teachers, and school officials about the benefits of using an alternative fuel like propane. This month’s newsletter is bittersweet for me since it will be my last. But, I’m not going far. I am moving over to the business development team to sell propane autogas school buses. 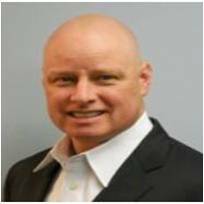 I have enjoyed my time on the service side the past five years, and am now looking forward to new challenges on the sales side. Mouw spends much of his time attending events and explaining how autogas makes the most economic and environmental sense for fleets. 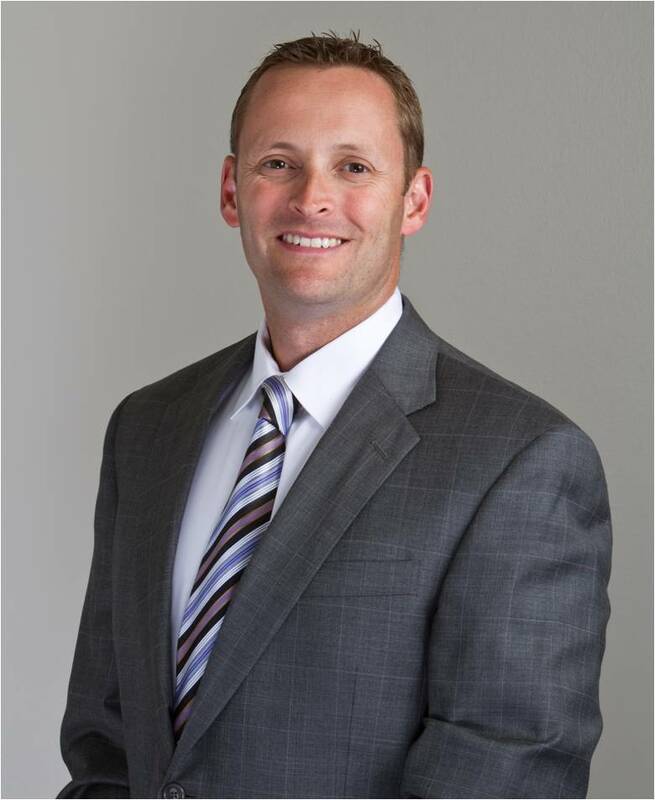 And in a decade of work, he has seen significant progress in the number of markets and fleets capitalizing on the benefits of propane autogas. In the new age, going green has become more important than ever and school districts throughout Northeast Indiana are considering doing just that. Directors of transportation met today to discuss the benefits of switching over from traditional diesel fuel to propane fuel. The switch could save people in more way than one. States will soon have access to a windfall of funds from the Volkswagen settlement. As you know, earlier this year, Wilmington Trust was appointed as the trustee to oversee the administration of the Volkswagen Settlement funds. The trustee effective date was established on October 2. Now, each state has 60 days from that date to determine and choose a beneficiary. Things have been set in motion. Who will be named your state’s beneficiary? The beneficiary is the state-level government entity responsible for developing and awarding its state’s funds. The state beneficiaries will have previous experience managing air quality and transportation grant programs and will be responsible for reporting to the trustee on the use of funds. They may be state energy offices, environmental protection departments, etc. Do you know the potential funding for your state? Each state will receive a set amount of funding based on the number of affected vehicles sold in the state. State amounts vary from $8 million to $400 million. A state-by-state listing can be found at ROUSHcleantech.com/volkswagen-settlement/. Once your state’s beneficiary is selected, they produce a draft plan for how the funds will be allocated. After the state files their mitigation plan, it must be made public for 30 days to open up for comment on the proposed program. Then, the state’s plan will be sent to the trustee for approval. Now what? It’s time to make your voice heard. Keep an eye out for any public comment periods that your state is offering and respond quickly. Make sure that you attend or listen in on public comment events and, even better, get on the agenda to present at them. Reach out to current school district customers to get them involved and encourage them to present at these hearings, also. The more voices for propane autogas, the stronger the message! Leave no stone unturned to get propane school buses included in your state’s mitigation plan. 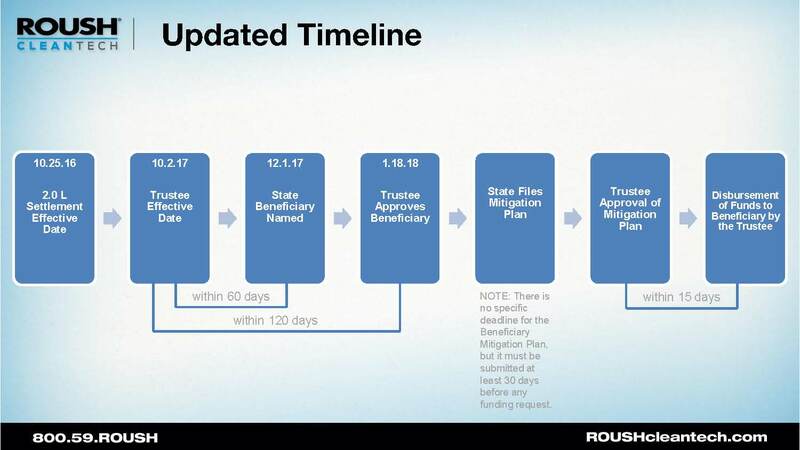 If you have any questions about the Volkswagen settlement or the Environmental Mitigation Trust, please contact Chelsea Jenkins at Chelsea.Jenkins@roush.com. Or visit ROUSHcleantech.com/volkswagen-settlement for more information. This month ROUSH CleanTech revealed its newest propane autogas vehicle. We announced this launch with a press release prior to a large expo this month. During this expo, we also set up media interviews with Todd Mouw to discuss the many industries that could benefit from this new model. And that includes the school bus market. The Ford E-350 single-rear-wheel and dual-rear-wheel cutaway provides a Type A propane option for servicing routes with fewer riders. This is also a great choice for school districts that need buses to navigate tight routes, like in urban areas. These vehicles maintain the same horsepower, torque and towing capacity as their Ford gasoline-fueled counterparts, and are powered by a Ford 6.8L V10 2-valve engine. They will be certified by the Environmental Protection Agency and California Air Resources Board and compliant with heavy-duty onboard diagnostics. We’ve had school districts and dealers specifically ask for this size school bus — and now it’s here. 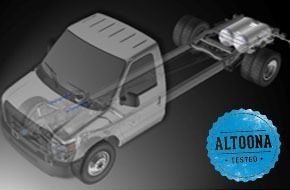 The propane autogas Ford E-350 cutaway will be available in 2018 model year. Orders are now being taken with deliveries beginning by late spring 2018. If you need help gaining media attention or drafting your press release for your propane school buses, or if you have any questions about the public relations process in general, please contact Chelsea Uphaus at Chelsea.Uphaus@roush.com. This year, we’ve been making some huge improvements to the way that we support your customers. We’ve invested in staff, added new contact center technology and improved our online warranty services. Since making this investment, we have increased our call handle rate to 95 percent, meaning you’re talking with an actual human being. Since hiring two more people in May to support our call center, we’ve reached a 95-percent call handle rate, which means you talk to a human being 95 percent of the time! Our phone lines are open Monday through Friday from 8 a.m. – 5 p.m. EST. We’ve invested in new contact center technology. You can now reach us via email at support@roushcleantech.com. We encourage you to take advantage of this new tool as it’s monitored regularly. If you reach us after hours, you’ll receive a response the next business day. We’ve also implemented a new process for warranty issues. Our warranty website can be accessed with a login. 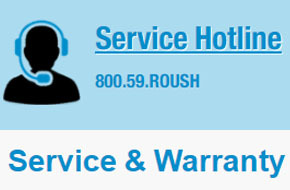 To register for a login, visit https://www.roushcleantech.com/warranty/. If you have employees who need access to your service and repair cases, they can also complete the login registration form. We will continue to monitor and make improvements on this new process. Have a question or comment? Please email Travis Wolf at Travis.Wolf@roush.com. Q. What are you doing that has made you successful with alternative fuels? A. Like many dealers, our best-selling tool is demo buses. We’ve also found customer testimonials to be extremely valuable. We rely on the honesty of our current customers. For example, two of our biggest propane advocates, Mesa Public Schools and Kyrene School District, have helped us get more school districts on board with propane buses. When they are asked about propane, they tell it like it is and don’t sugarcoat anything. Q. 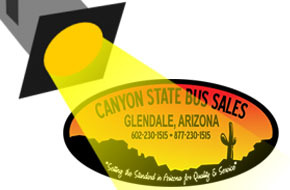 How do you introduce propane-fueled buses to prospective customers? A. We have a lot of varied school districts in Arizona, from extreme rural districts to urban districts. Some of them are a more natural fit for propane. We do some initial screening based on the school district, and then let our research guide how we interact with the school district representatives and which products we talk about. In our first meeting, we can sense how receptive they are to alt fuels and where their level of knowledge is. In other situations, we’ve had people approach us about alternative fuels based on seeing our ads or hearing about us at shows. This has proven to us that placing advertisements and having a show presence works! Q. How are you positioning alt fuels in your area? A. We’ve seen an interest in all the fuels across the board, and we’ve been very successful with propane. When we lay out the economics, propane is the leader by a long shot. We have propane customers on board with the fuel but are still hanging on to some diesel buses because of duty cycles. We’re hopeful to convert those customers to all propane when the time comes. Our key to success is that we haven’t tried to oversell the benefits of propane to make the sale. Propane is great in certain markets, but not the best in all situations. We have districts that run daily trips of hundreds of miles that propane doesn’t work well for. We are always honest with our customers. We’ve also seen some interest in compressed natural gas. CNG has gotten a lot of the public’s attention, but folks still have many questions. We had one school district rep who was very gung-ho on CNG, so they were going to go with CNG one way or the other. That was our first CNG sale. Q. Is there any advice you’d like to give to other dealers? A. I would say don’t be afraid to embrace alternative fuels and more importantly, to believe in the product. Get out there and do the research. You will find customers in your market who will benefit from alt fuels. At the end of the day, it’s nice to have all the tools in the toolbox, so you can tailor a solution to what your customers need, not force them to go with one fuel. A local school district has saved over $63,000 in two years by switching more than one-third of its school buses from diesel to propane, according to a Propane Education & Research Council (PERC) case study. For fleet owners, it’s time to clear the air — of harmful gases like nitrogen oxides (NOx). As discussed in our last post, “Say No to NOx.” NOx are reactive gases that pollute the air, contribute to acid rain and can trigger health problems.